About two years ago, state environmental regulators announced a controversial move to close the last two vehicle emissions testing facilities in Chicago, along with two other testing sites in the suburbs. Officials with the Illinois Environmental Protection Agency said the closures stemmed from a new seven-year contract with the Chicago-based company Applus Technologies to conduct vehicle emission tests for the state starting in November 2016. The agreement, officials said, would save the state agency $100 million over the course of the contract, reducing the cost of each emissions test from $6.95 to $2.85. 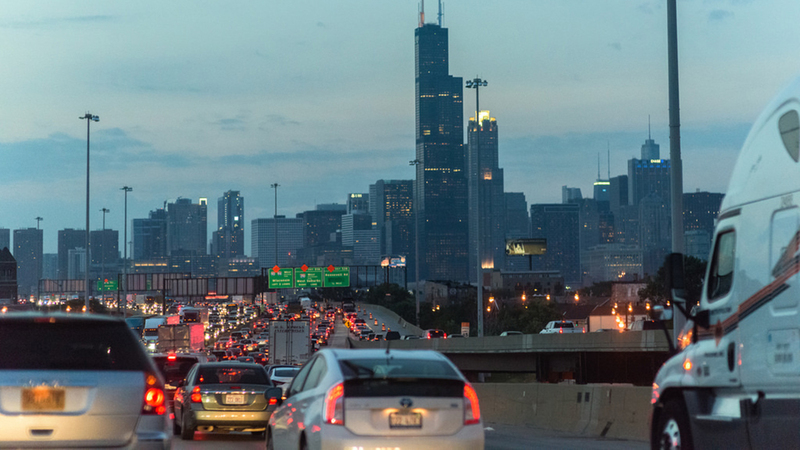 But a new analysis shows that the move came at a cost to hundreds of thousands of Chicagoans, with the biggest impact on low-income and minority drivers. The decision also had a negative impact on area roadways and the environment. City vehicle owners traveled an estimated additional 1.9 million miles over the past two years as a result of the two Chicago testing sites closing, according to a recently published study. The additional travel amounts to an increase of nearly 768,000 kilograms of carbon dioxide emissions. Put another way, those extra 1.9 million miles produced the same amount of carbon dioxide emissions as that produced by the electricity used in 115 homes in a single year, according to the EPA’s Greenhouse Gas Equivalencies Calculator. The study is based on state emissions testing data from 2014-15 for more than 380,000 vehicles tested at the two now-closed Chicago facilities. Illinois EPA did not provide researchers with data for the Tinley Park and Elk Grove Village testing sites that closed in 2016. With city drivers forced to visit testing facilities in Skokie, Addison, Bedford Park, Markham or other suburbs, motorists spent an additional 45,000 hours on the road, according to the study, which was published in the Transportation Research Record. The journal is part of the Transportation Research Board, a division of the National Research Council that serves to advise the president, Congress and federal agencies on scientific matters. “The findings are exactly what one would have anticipated from the Rauner administration’s misguided decision to close down all testing locations in Chicago and force people from the largest city in the state to go to the suburbs to get their vehicles tested," said Howard Learner, executive director of the Chicago-based Environmental Law and Policy Center. Even before the closures, vehicle owners in poor neighborhoods already had to travel farther distances to emissions testing sites than residents in other areas of the city. Both of the city’s testing sites were located on the North Side, with one in Bucktown at 1850 W. Webster Ave. and the other in Harwood Heights at 6959 W. Forest Preserve Ave. Drivers in poor and largely minority communities now have to travel more than 11 miles to the nearest testing facility, while drivers in other zip codes travel 9 miles on average, researchers found. State law requires that emissions testing facilities be located within 12 miles of drivers. But the figure is defined as a straight-line distance, which does not reflect actual distance traveled on the road, said Lauren Nolan, a co-author of the study and research director at the Woodstock Institute, a Chicago-based nonprofit. Nolan said that of the nearly 60 zip codes associated with vehicle owners in Chicago, drivers in more than one-third of them must now travel more than 12 miles via roadways to the nearest emissions testing facility. More problematic, Lowe and Nolan said, is the fact that closing the testing sites has had a disproportionate impact on drivers in poor neighborhoods. “I think this is an important example of the multitude of ways that transportation regulation is done in ways that are inequitable,” Lowe said. Most 1996 and newer gasoline-powered vehicles are subject to emission testing every other year once the vehicle is four years old. Closing the Chicago facilities discourages compliance with the state's vehicle emissions requirements, which are meant to reduce pollution, Learner said. A spokesperson for the Illinois EPA raised doubts about the study's findings. "It is important to note that there is no way to determine the decisions individual motorists make when determining when and where to have one’s car tested," said Kim Biggs, spokesperson for the Illinois EPA, in an email addressing the study. "Do they plan to get their car tested while running other errands? Could they be travelling for other purposes and reconfigure their travel plans to take a route that is closer to a testing facility? "It is difficult, if not impossible, to pinpoint how and when a motorist will travel to an emissions testing station and what emissions testing station a motorist will decide to visit," she continued. "It is equally as difficult to determine whether that visit truly results in an increase in vehicle miles traveled." Biggs also said that studies examining the travel impact of changes to emissions testing sites "rely on assumptions and variables." "The Illinois EPA is continually assessing vehicle emissions testing technology and methods to increase efficiency and convenience for the motoring public," she said. Lowe, meanwhile, said the study demonstrates conflicts that can arise when a state uses a private company to conduct services such as emissions testing.